The PZ Pilot Pro hi-resolution ink jet printing system offers 2.1″ print height from a single print head with the ability to run up to 4 print heads from a single controller. The PZ Pilot Pro offers a versatile, yet cost effective solution for your coding applications. The PZ Pilot Pro utilizes 380 print heads that print up to 2.1″ in height, exceeding the GS1 specification for case code printing without the additional cost of a larger print head. Industry proven piezo technology produces razor-sharp text and dark print for increased bar code scannability. PZ Pilot Pro 382 printheads print up to 2.1” in height, exceeding the GS1 specification for case code printing, without the additional cost of a larger printhead. Larger print engines cost more to begin with, cost more to replace, and utilize significantly more ink. PZ Pilot Pro offers the right size print engine for your case coding application. Industry proven piezo technology produces razor-sharp text and dark print for increased bar code scannability. In addition, the PZ Pilot Pro can run at speeds up to 167 feet/minute, more than enough for most secondary packaging lines. The PZ Pilot Pro is designed with low maintenance features that users have come to rely on from Squid Ink. The PZ Pilot Pro features ATM-simple, easy to follow user prompts to program, save and store messages. In addition, the built-in software automatically calculates ink usage for each message so you can modify your messages and control your consumable costs. 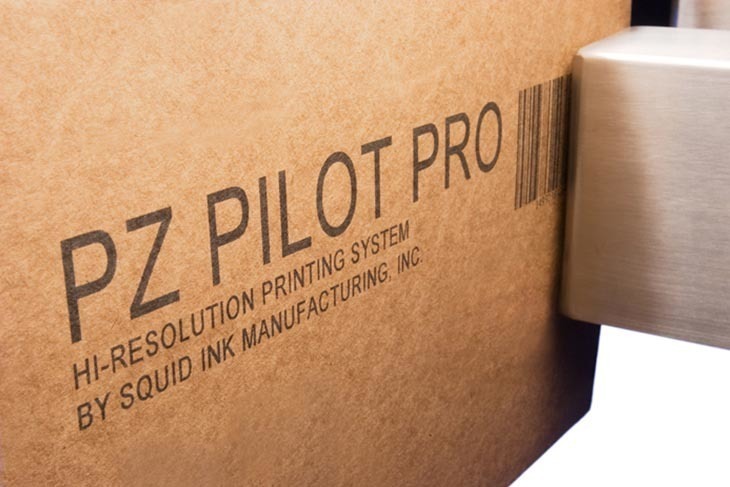 Best of all, PZ Pilot Pro utilizes Squid Ink’s best selling oil-based ink designed specifically to provide high contrast quality print without printhead maintenance or dry out. More options for marking your mark: oil-based systems for printing on porous surfaces like corrugate, or solvent-based systems for printing on products like glass, plastics, metal or more.